Welcome to 2008 … and welcome to the new version of the blog: fresh new look, same great taste! Please be sure to change the link in your bookmarks and, if you are so kind as to link to me on your blog or site, please be to update that link, as well. If you tuned in yesterday then you already know the story behind my desire to make a New Year’s Pretzel, more properly known as a Neujahrspretzel. The internet, it turns out, is not a great well of knowledge on the subject. I did, however, find a recipe and my version of it is below. It is tradition to eat the pretzel for breakfast on New Year’s Day, but here at the Outpost we like to turn tradition on its head from time time. We broke our pretzel just after midnight in the hopes that it will bring good luck through the new year. We then, of course, ate pretzel again this morning for breakfast. 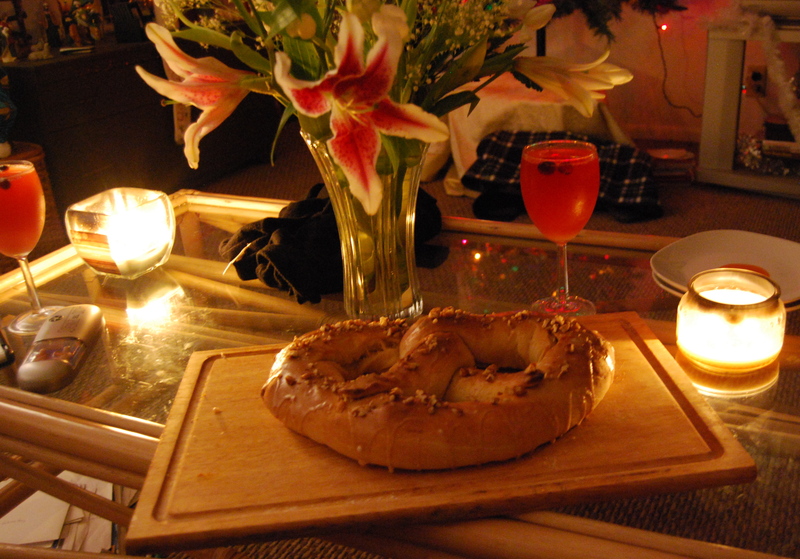 The pretzel is delicious – a sweet, chewy, very satisfying type of bread. The recipe below is enough to make two large pretzels, Halve the recipe to make one pretzel, or do as I did and make the whole recipe and freeze half. The half now sitting in our freezer will not be twisted into another pretzel as that is only for New Year’s and I can think of several other delicious uses for the dough. 1. Heat soymilk and Earth Balance in a saucepan until very warm . In a large bowl, mix the yeast, salt, sugar, and 1 cup flour. Slowly beat the warm soymilk and EB into the dry ingredients and beat for 2 minutes. Add soy yogurt, oil, and 1 cup of flour and beat for an additional 2 minutes. 2. Add enough flour (between 3 and 4 cups) to form a soft dough. Knead until smooth and elastic, about 5 minutes, adding the remaining flour throughout to prevent the dough sticking to your kneading surface and your hands. Place dough in a greased bowl. Let rise in a warm place for about 1 hour. 3. Punch dough down and let rise again for another hour. Divide dough in half. Roll dough into a rope about 30 inches long and 1 1/2 inches in diameter and shape into a pretzel. Repeat with second half of dough or freeze that half for later use. 4. Place pretzel(s) on greased baking sheets. Let rise 15 minutes more. Bake at 375 degrees F for 20 to 30 minutes or until golden brown. Cool on wire racks. 5. To make icing: mix confectioners’ sugar, water vanilla, and almond extract. Add more water if you would like an icing with a thinner consistency. 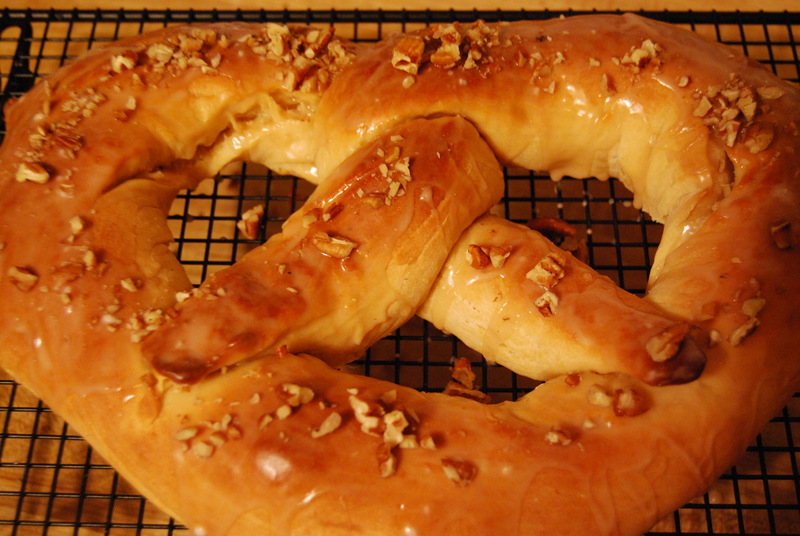 Drizzle or spread icing on pretzel(s) and sprinkle with chopped nuts. Also, on this first day of the new year I would like to take moment to look back at the year just passed. Listed below are my favorite recipes posted to the blog in 2007. Tops at the Outpost in 2007 were…. I wish a very happy, healthy, joyous, prosperous, and delicious new year to all!!! Whoever heard of a New Years pretzel? In Florida we just do beer and wingies. The pretzel was truly delicious and I am looking forward to next year’s pretzel already. Happy New Year to all! OMG, a preztel recipe! Yes! Maybe I’ll muster the motivation to, you know, actually make one of your recipies. .. . Your blogs new look is great! And that pretzel looks and sounds wonderful! Happy new year! As Dan already knows, we also used to bang pots and pans to mark the new year instead of blowing off firecrackers. Jennifer – Thank you for giving me more reasons to use (and maybe make?) more dough! I decided to switch to WordPress because I wanted something more dynamic for my blog. I felt that to make my blog more personalized with Blogger, I needed to be way more techno-savvy than I am (ie able to use code) to do so. WordPress also has some neat features that I was attracted to. James – Do it! Do it now! Courtney – Thank you! Happy new year to you, too! Incredible Pretzel! I love reading about all the delicious items you make….although I must admit I haven’t tried any yet and got a funny look from Julia when I told her I wanted to make a holiday fruit cake. The new blog is cool too. I just started one a little while back on Blogger but haven’t put a whole lot of posts on yet. Best wishes for a great 08 and we hope to see you guys soon. Aloha Chris! Maybe next year you can convince Julia what a delicious idea fruitcake really is 🙂 I’d love to check out your blog, so please next time leave the address for me. Tell Danny the reason we banged pots and pans is because Fireworks aren’t sold in PA.
one question is your muffin recipie here?